To celebrate the 200th blog post of Bleistift: a (small) giveaway. If you can tell me the link1 between the two items in the photo you will receive a small prize. What’s the link between these two items? Giveaway rules: The first correct answer wins. I’m happy to send the small prize to any country as Royal Mail is delivering to that country. Another cause for celebration2 is the fact that today is Franconia Day (Tag der Franken). Franconia is home to the well-known stationery manufacturers Staedtler, Faber-Castell, Schwan-Stabilo, Eisen, Möbius & Ruppert, KUM and others. Congratulations on your 200th post – keep up the good work! Congratulation for great blog you run. I’ll just make a crude guess about the link between the staedtler noris and the piece of hardware. The missing link is the 990 digital pen produced by Staedtler. It combines the traditional writing with the computer, instantly displaying on the pc what you write on a piece of paper. Gunther, I haven’t heard about the macro filming hack with the eraser, I should look hat up. I saw one linked to photography once, it was about digitising old film. Sorry, this is not the link I had in mind. Rares, unfortunately this is not the link I had in mind. Maybe you can think of another link between the items? I’ll give a hint if there are more unsuccessful attempts. Just wish to congratulate you on your 200 posts indeed! Well done Matthias! You deserve a medal. re: the link between the two items. It’s pretty obvious, isn’t it? “Staedtler Noris” is an anagram of “Saltier Rodents”. Mice are rodents, and there’s always a need to build a better mouse trap. So, the component in the picture must be part of your newly designed mouse trap, which works in part by smothering them in salt. I mean, what else could it possibly be? Oh, I fear I made the question too difficult. Here’s the first hint: There’s only a link because the Noris I put there is a specific kind of Noris. If it was another kind of Noris there wouldn’t be this link. You can submit as many guesses as you want. The EAN on the Noris indicates that it was produced in Neumarkt. – Are the ferrule and the eraser of any importance for the link? The Noris was not made in Neumarkt. Maybe the EANs are the same …or were the same for some batches of Noris. One idea: Having one EAN might make it easier for shops – they don’t have to have different records and enter different prices in their database for what is basically the same pencil. Staedtler is also using article numbers used more than once, e.g. 151 = German Mars ergosoft, but 151 = Malaysian Atlas, too. Ferrule and eraser are of no importance for the link. 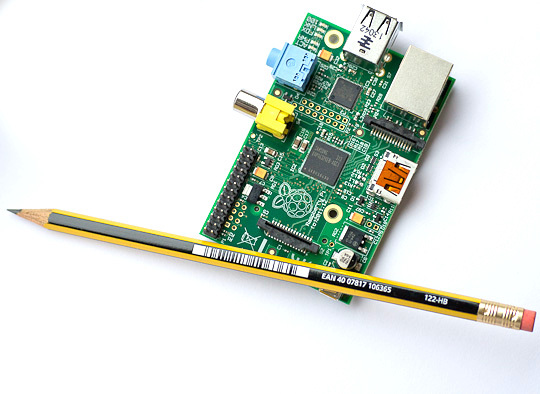 Raspberry Pi has a Model A and a Model B, and the Noris has two versions, with and without eraser? Ah! Both items are from Wales – is this the link? Sam Carter, good idea, but that’s not the idea I was thinking of. As you might know, Model A and Model B is a reference to the BBC Micro. Gunther, yes, that’s it. Congratulations, you win some Welsh-made pencils! The Raspberry Pi and the Noris on the photo are both made in Wales. As far as I know the factories are not far from each other (~10km). Thank you! However, since you have been so kind to send me some Welsh-made pencils more than once I would be happy if you could give them to another blog reader. Would that be OK? Of course, I’m just not sure how to determine who should get them. Would you like to pick the winer or do you have an idea how to pick the winner? Sean’s explanation is worth a special award 😉 Maybe he in interested in the pencils. Saltier Rodents really made me laugh. I’ll contact Sean. Thanks for your generosity. I have no idea what the link is but I’m having fun reading all the answers given. I am going to give a guess though: Both were made in Great Britain? Congratulations on the 200th post! Great blog! Well, here’s an alternate solution. Noris sounds like “norris”, as in Chuck, who acted in the movie Delta Force. The Rasberry Pi has two “initials”, r and p, which, combined with the d from delta, form drp, or disaster recovery plan, which doesn’t exist for this far fetched solution. Thank you for your comments and the congratulations.